Applicants are required to submit a current resume, a letter of interest, salary requirements and the names and contact information of three references. Alpha Sigma Alpha Sorority is accepting applications for an opening in the collegiate services team. 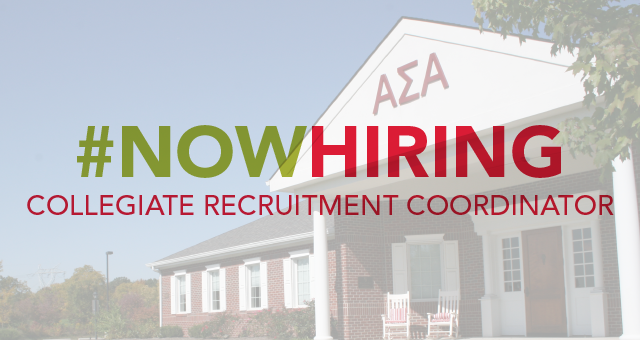 The Sorority will be hiring another collegiate recruitment coordinator which will replace the previous collegiate expansion coordinator position. Collegiate recruitment coordinators are part of the national headquarters team vital to advancing the Sorority’s mission and purpose. This position oversees the new chapter development program, working with newly established collegiate chapters from their initial establishment through the first three years of their existence. As part of the application process, applicants are asked to submit a cover letter, current resume, salary requirements and the names and contact information of three references. Please note that this position works out of the national headquarters in Indianapolis. Remote employment is not an option for this position. Please contact the Krystal Slivinski, executive director, with questions.